The Candy Castle has a long history. 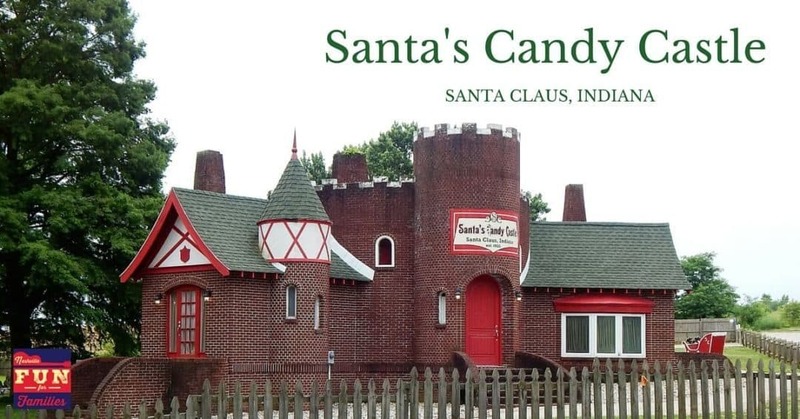 Started by Milton Harris, the Candy Castle was the first building in his dream themed attraction “Santa Claus Town”. He began planning in 1932, before any other theme park existed and opened in December of 1935 to great fanfare. The Grand opening was attended by thousands, covered live on the radio (this was before TV) and it marked the first attraction in Santa Claus, Indiana and the first themed attraction in the U.S. In 1936, a second building, the Toy Village opened and allowed children to play with the toys of the day for free. Sadly, everything changed in 1941 with the outbreak of World War II. Tourism stopped as the country supported the war effort. After the War, Mr. Harris tried to resuscitate his dream, but sadly, he died of a heart attack in 1950 before it happened. Several owners tried to keep Santa Claus Town going, but were not successful and it closed in the 1970s and sat vacant. Then, in 2005 the lights came on again and a family brought the Candy Castle back to life, reopening in 2006. We visited on a summer afternoon and had a great time browsing the rooms of candy. From hand crafted confectioneries to custom popcorn flavors to candies of yesterday, the Candy Castle has it all! There is a room dedicated to Jelly Bellies with every flavor you can imagine. Another room holds kids’ favorites including Pop Rocks, Nerds, and other fruity and gummy favorites. In addition to candy, the Candy Castle boast 32 different flavored hot chocolate mixes. You can also enjoy their famous frozen hot chocolate. It’s like a chocolate shake but ten times better! In the middle of the castle, browse through Christmas themed books and see the Santa Claus Wall of Fame and learn the history of the Santa Claus Oath. You can also check in with an Elf via a special webcam to see if you are on Santa’s Nice List. Both my kids enjoyed this and recieved a a really nice certificate to take home. And if you are there and it’s not crowded ask if you can make some snow. It’s a great way to experience the magic of Christmas anytime of the year. If you are in Santa Claus, Indiana visiting Holiday World, be sure to stop by! What is the address? What is the cost to get in? Hi Martha, There is a map link at the bottom of the article. I have also updated and added the address from the map link. It’s free to get in.